Blue Gum Swamp Mountain Bike Ride, Blue Mountains, 9km loop, 5 stars. Blue Gum Swamp mountain bike ride, Blue Mountains. The Blue Gum Swamp mountain ride is a superb 10km loop. This is a very scenic ride taking you though tall straight Blue Gum trees and ferns spread out across the valley floor. There are also a few creek crossing so be prepared to get your feet wet. The mountain bike trail would be rated easy to intermediate. There are a few step sections which beginners would need to take it easy and watch their speed. If you want to make a full day of it on your mountain bike in the blue mountains you could do Hanging Rock in the morning and Blue Swamp in the afternoon. This would give you around 20km on the bike and match your trip to the Blue Mountain very worthwhile. I highly recommend this ride, 5 stars. Google Map Link. The Blue Gum Swamp mountain bike ride is at the lower section of the Blue Mountains. Drive to the end of White Cross Rd, Winmalee, NSW. 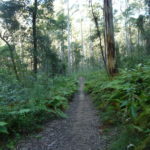 The photo’s below are of the Blue Gum Swamp mountain bike ride in the blue Mountains. Blue Gum Mountain bike ride Youtube Clip. Mountain bike ride Blue Mountains, Blue Gum Swamp mountain bike trail, track, mountain bike trails Blue Mountains.